Esophageal cancer is the cancer of the esophagus which is a hollow long tube allowing the food to move down from the mouth to the stomach. Esophageal cancer is one of the top ten cancers causing death worldwide. It is more common in areas of northern Iran, some areas of southern Russia, some parts of Africa, northern China and some parts of Asia. Esophageal cancer affects men more than women with a male: female ratio of about 3-4: 1. Esophageal cancer most commonly occur in patients in their 60-70s. There are two main types of esophageal cancer depending on the cell type involved. Squamous cell carcinoma is more common and affect the squamous cells (thin flat cells) that line the middle portion of the esophageal wall. It is associated with cigarette smoking and alcohol drinking. Adenocarcinoma is less common and affect the mucus-secreting glands at the lower portion of the esophageal wall. It is associated with gastroesophageal reflux disease (GERD), obesity and Barrett Esophagus disease. Other rarer forms of esophageal cancer include lymphoma, melanoma, choriocarcinoma, sarcoma and small cell cancer. Esophageal cancer develop when the squamous cells or mucus0secreting glands undergo DNA mutation triggered from chronic irritation after exposure to noxious or toxic stimuli. This results in formation of abnormal cancer cells which grow and form a cancerous mass. The cancer mass can cause narrowing of the esophagus canal and also invade to nearby structures or spread to distant organs. Smoking and alcohol consumption increases the risk of squamous cell carcinoma. HPV infection has also been associated with esophageal cancer. 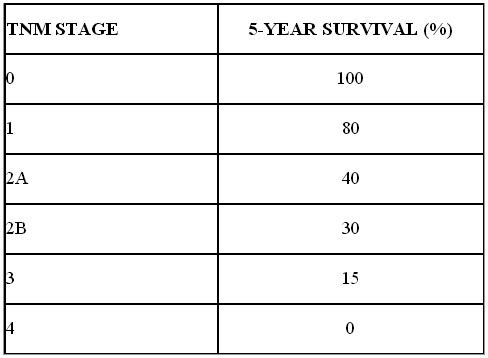 Long standing Gastroesophageal Reflux Disease (GERD) results in Barrett Esophageal disease (pre-cancerous stat) and eventually poses a risk of development of adenocarcinoma. Other risk factors include drinking very hot liquids, eating few fruits and vegetables, eating foods preserved in lye (lutefisk, salted fish), achalasia (difficulty swallowing as esophageal sphincter won't relax), and nutritional deficiencies (e.g. Riboflavin) and nitrosamines in soil. 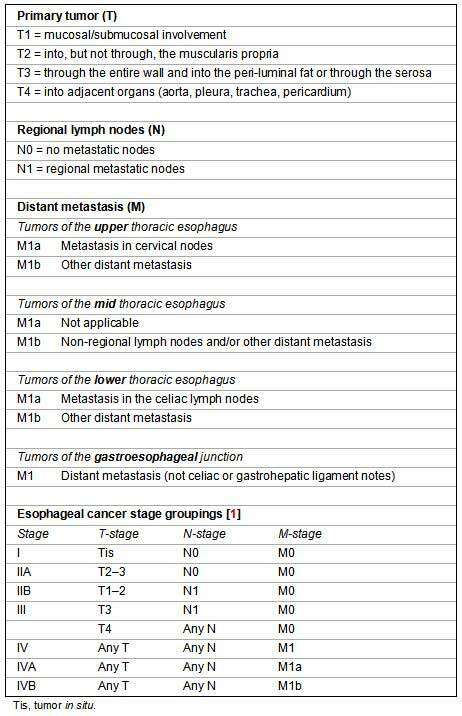 The stages of esophageal cancer depends on the extent of invasion of the tumor, the lymph nodes involved and whether there is any distant spread of cancer to other organs. It is often staged according to the TNM (Tumor Nodal Metastasis) system. 1. Loss of weight: this is present in 50% of patients and is 2nd commonest symptom. 3. Pain: Upper central abdomen (epigastrium) pain may be experienced by patients. If patients have bone pain it may suggest that cancer has spread to the bones. 4. Hoarse voice: If the tumor has invaded the laryngeal nerve it can cause hoarseness of voice. 6. Aspiration of food: if the cancer has invaded into the trachea and bronchus it can cause food to regurgitate into the lungs and cause aspiration pneumonia. 7. Heartburn: Some patients may have vague heartburn and indigestion which may be mistaken for gastritis and gastric reflux. Usually physical examination may be normal. Patient may appear cachectic. If the cancer has spread to the lymph nodes then the cervical and clavicle lymph nodes may be enlarged. In very late advance stages of cancer when it has spread to the liver, the liver will be enlarged. 1. Esophagogastroduodenoscopy (OGD): An endoscope which is a hollow tube with a lens is inserted through the mouth and down the esophagus to the stomach to allow visualization of any possible ulcer, mass or bleeding points. Suspicious mass tissue will be removed (biopsy) and sent to the laboratory to confirm presence of cancerous cells. 2. Endoscopic ultrasonography (EUS): using endoscopy procedure to do an ultrasound visualization is a good modality as it allows clinician to determine the Tumor (T) death and whether there is presence of peri-esophageal lymph nodes (N) which is used for staging of disease. 3. Barium swallow: Patient will drink a liquid called barium which will coats the lining of esophagus for a series of x-rays to be taken to examine the esophagus. It is good to look for any strictures and mass in the esophagus. However it cannot be used for staging and biopsy. 4. Bronchoscopy: Inserting a tube into the trachea and bronchus is used for cancers of the middle and upper third of the thoracic esophagus to exclude invasion of cancer cells to the trachea or bronchi. 5. CT Scans: Ct scan imaging of the thoracic and abdomen is used for staging of the disease to look for extension of the disease to distant organs like lungs or liver. 6. PET Scan: A more advance imaging modality to determine spread of cancer to other organs, lymph nodes or bones. The treatment options depends on the stage of the disease. For patients with Stage 1 disease especially Tis (tumor in situ) and T1aN0, the cancer mass can be removed during endoscopy. For patients with T1b and any Nodes involved, surgery is the initial treatment of choice. For stages above T1b, multi-disciplinary specialists will get together to discuss treatment modality. It often involves surgery, chemotherapy and radiotherapy treatment (trimodality). Chemotherapy and radiation therapy may be given before surgery to shrink the tumor first to aid surgery. For Stage 4 advance disease, treatment is mainly palliative. They can be treated with chemotherapy or supportive care to relieve symptoms. Esophagectomy is the surgical procedure to remove the portion of your esophagus that contains the tumor and nearby lymph nodes. An esophagectomy can be performed by using an abdominal and a cervical incision. Newer techniques laparoscopic minimally invasive surgery also commonly known as keyhole surgeries uses smaller incisions and allows shorter hospital stay, less postoperative discomfort, and much faster recovery time than with open surgery. - Patients who are medically unfit for surgery such as patients with severe cardiovascular disease and respiratory disease. Pre-operative (neoadjuvant) chemotherapy and radiotherapy given before surgery can reduce the bulk of the primary tumor to facilitate higher curative resection rates and to eliminate or delay the appearance of distant metastases (spread of cancer cells). Patients who have very advance esophageal cancer and those who are unfit for surgery will need palliative care to minimize dysphagia and allow feeding. Chemotherapy when used alone has limited use to relieve dysphagia. Radiotherapy successful in relieving dysphagia in about 50% of patients. Laser therapy with Nd: YAG laser can help to temporary relieve dysphagia in as many as 70% of patients. Multiple sessions need to be done to keep the esophagus lumen patent. A stent can be inserted during endoscopy to keep esophagus lumen open for food passage. Stop smoking and alcohol consumption as these factors are linked to development of esophageal cancer. Have a healthy diet filled with vegetables, fruits and adequate vitamins. For esophageal adenocarcinoma, the preceding condition is Gastroesophageal reflux disease (GERD). Prevention of GERD to develop into pre-cancerous Barrett esophagus is the key. Controlling symptoms of GERD will prevent this sequelae. Endoscopy examination every 1-2 years interval to detect any presence of dysplasia changes (cancerous changes) in Barrett esophagus. Dysplasia in Barrett esophagus can be treated with endoscopic ablation, using radiofrequency ablation (RFA), photodynamic therapy (PDT), or cryotherapy. RFA involves the use of electrodes to generate heat and destroy abnormal tissue. Photodynamic therapy uses a special drug that is injected into the tumor and then exposed to light. The light activates the drug that attacks the tumor cells. Cryotherapy is a technique that uses an extremely cold liquid or instrument to freeze and destroy abnormal skin cells that require removal.